In a tour de force, Harvey Korman plays three different roles, including a space alien who hits on Bea Arthur—perhaps the most implausible creature in the entire Star Wars universe! Mark Hamill wears so much make-up that he looks like he’ll break into a show tune at any moment. Carrie Fisher sings lyrics to the Star Wars theme. Look at her eyes and it’s hard not to come to the conclusion that she’s high on cocaine. But for fans of infomercials the most interesting bit may come at the end of the program. 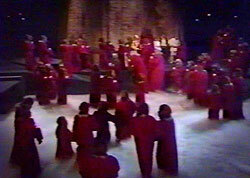 As part of the “Life Day” rituals, wookies don red garments. Seeing this I turned to my friend and declared, “Chewbacca and his family are wearing Snuggies!” Indeed, the Snuggie Blanket with Sleeves looks much like the ceremonial Life Day robes worn by the wookies. 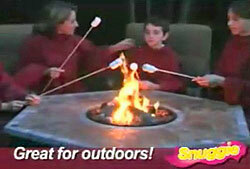 So the Snuggie is great for all sorts of outdoor activities. Not only going to campouts and football games—but also for carrying mystical snow globes while walking into the sun. The Snuggie fleece is warm enough to keep wookies cozy while they inexplicably walk through outer space—and we all know how cold it can get out there! Even with a thick coat of fur wookies still need a “blanket with sleeves” to keep them warm during the holiday. 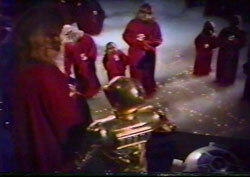 Most likely Chewbacca’s wife Malla bought Snuggies for her family from trader Saun Dann (played by Art Carney). I just hope she didn’t get ripped off on the shipping charges! This made us laugh really hard! Those humans steal all of the wookie fashions! Oh, man, now this will make my husband want one EVEN MORE!!! 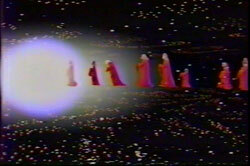 You’d be high on cocaine too, if you knew you had to parade around in a Snuggie on national television. Here’s the complete special on Google Video, so we can all not enjoy it. Original 1978 commercials included! Equally important is the corresponding “Rifftrax” commentary- three guys from Mystery Science Theater 3000 watch, and heckle, the entire special. Only 4 bucks! may the snuggie be with you! 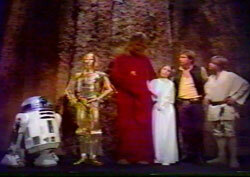 I bought the Star Wars Holiday Special from the link that you provided. I’m going to watch it tonight! From the far corners of the interwebs, this important update on the Snuggie and its relationship to possible future snacking opportunities. 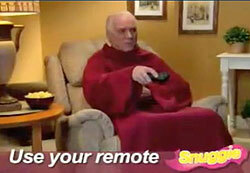 Check it out, Snuggie fans. did y’all notice that the old dude who is eating the popcorn is the same guy from the commercial for the hearing aid enhancer who is watching tv while his wife sleeps? Cool! I also noticed him on both commercials! I come across other situations in which an actor or actress appears in separate commercials for completely different products. I wonder if they put “Professional TV Commercial Actor” on their resumes. Here is another version of this item, (to my ignorant eyes, at least), sold by Anne Klein for $219. Thanks for reminding people how Star Wars geeks got their reputation for being petty, pathetic losers. 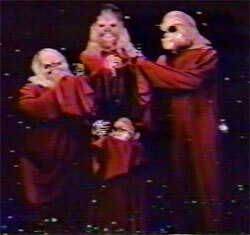 And just because of your useless, graceless comment, I vow to spell Wookie with one “e” for the rest of my life!